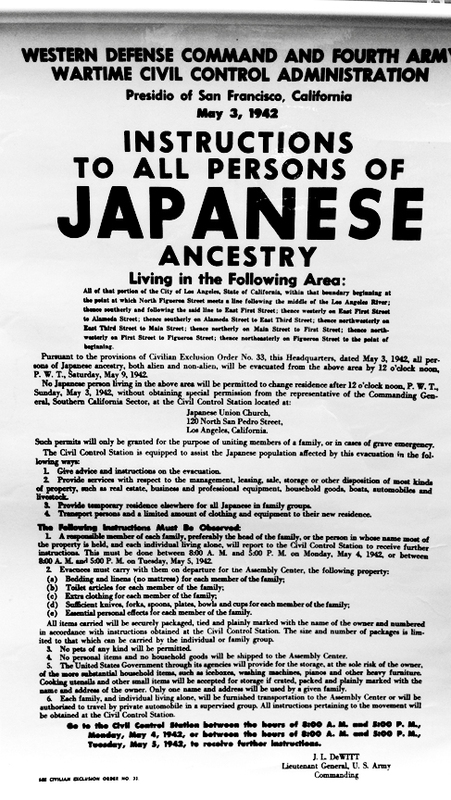 AMERICAN NISEI VETERANS: Go fo' Broke! He served as curator of the Military Museum at the Presidio of San Francisco from 1973-1986. In 1980, he co-founded the Go for Broke 100th/442/MIS Foundation (later called the National Japanese American Historical Society). He was curator from 1981- 1987, producing exhibits including, "East to America", which chronicled the story of Japanese American immigration to the United States, and an exhibit entitled, "Unlikely Liberators" on the Japanese American soldiers of the 522nd Field Artillery Battalion who liberated the infamous Dachau Death March. Here is a speech by Eric Saul, US Army historian, given at the ceremony to honor Medal of Honor winners William K. Nakamura and James Okubo in Seattle, Washington on March 25, 2001.
or from concentration camps in America? so land was put in your name. and professionals, but you couldn't. No one would hire you. So you worked on your family farms, flower orchards, and shops..
You were often segregated in the Little Tokyos and Japantowns. You couldn't go where you wanted, be where you wanted, be whom you wanted. So why did you join the Army? the most decorated Army unit that this country has ever produced? There were words like giri and on, which your parents taught you. Which means "duty," and "honor," and "responsibility." You had to pay back your debt to your country. AND you had to prove your loyalty at any cost. when you volunteered from those camps. Kodomo no tame ni: "for the sake of the children." but you knew you wanted to have families. And you knew that you didn't want your children to have to suffer as you did. If you went into the military, did your job, perhaps things would change. You knew it, and you fought for it. that's on this honored regimental flag in front of me. It was "Go for Broke." You set the tone for your own regiment, and lived up to its motto. your children can now be what they want in a country that you wanted for them. and you don't talk about it, it must be really, really good! You never talked about your wartime record. and you didn't even tell the country. Gaman: internal fortitude, keep your troubles to yourself. Don't show how you're hurting. Shikata ga nai: sometimes things can't be helped. But other times, you have to go for broke, and you can change things. Haji: don't bring shame on your family. When you go off to war, fight for your country, return if you can, but die if you must. I wanted to know why you joined the Army. Why did you join from a concentration camp? A veteran from Cannon Company named Wally told me a story. which was an Assembly Center for Japanese Americans. There, they were put in a horse stall. and they were a middle-class family. Now they were living for weeks in a horse stall that hadn't been cleaned when they moved in, and it stunk of horse manure. "Remember that a lot of good things grow in horse manure." the chaplain of the 442nd, who was from Hawaii. I asked him, "How could the Niseis have joined the Army under these circumstances? How could they have done what they did?" and hadn't suffered the same discrimination. who had been killed in combat. He remembered going through the pockets of one mainland Nisei. had been burned down by racists near Auburn, California . 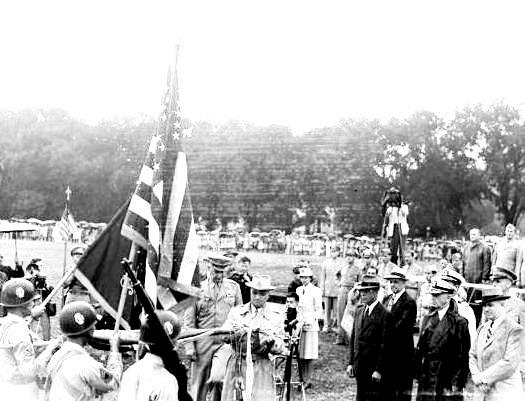 Yet this Nisei still volunteered for the service. to give to this Nisei who had been killed and was lying in front of him. Chaplain Higuchi had to write a letter home to his parents. You Nisei fought for this country, your country. but you made democracy stand for what it really means. President Truman had a special White House ceremony for you. had a ceremony at the White House for a unit as small as a battalion. and Truman's aide said, "Let's cancel the ceremony." I can stand a little rain." with the motto of "Go for Broke,"
what you have done for this country. You fought not only the enemy, but you fought prejudice and you won. the welfare of all the people, all the time." Lastly, he advised the Niseis to keep up that fight. So in the 1980's you fought for redress. was the overwhelming record of the 100th/442nd and the MIS. for your parents and for your suffering. You never lost faith in your country, and we are here today to celebrate that faith. The result of that faith is that your children can be anything that they want: professionals, doctors, and lawyers. The 100th/442nd suffered 314% combat casualties. The 100th/442nd was an oversized regiment, with its own cannon and engineer company, and even its own artillery battalion. had to be replaced nearly three and one half times. Eventually, about 14,000 men would serve in the 100th/442nd. I see many of my friends from I Company and K Company here today. who couldn't be rescued by their own division. of almost five days of constant fighting. In K Company, you started off with 186 riflemen. there were only eight men standing. and for that you won two presidential unit citations. to be among the top ten battles fought by the U.S. Army in its 230-year history. has won that many presidential unit citations. there were eighteen thousand medals for heroism and service. history for its size and length of service. which protected the Po Valley and the entrance to Austria ..
And those three divisions couldn't do it - they were stalemated for six months. The Army then asked the 442nd, the "Go for Broke" Regiment, to break the stalemate. The commander and officers of the 100th/442nd said to the commander of the 92nd Division, "General Almond, we have a plan. if you give us 24 hours. "Impossible. We've had three divisions hammering away at the Gothic Line." and it was considered an impenetrable fortress. and we'll do the rest." But you Nisei soldiers had your own plan. You were smart. which was eight points higher than necessary to be an officer in the Army. You were barely a hundred twenty-five pounds soaking wet, but you were college-educated, and you were going to "Go for Broke." which the Germans had so heavily fortified. You climbed it where they didn't expect you. It was nearly a 4,000-foot vertical precipice. You climbed the mountain that was unclimbable, in combat gear. The Germans couldn't possibly expect an attack from that point..
From nighttime until dawn you climbed, almost eight hours..
and no man cried out as he fell. You took the mountain and you broke the Gothic Line. as the Army had planned. It didn't take six months. The U.S. Army reported that you broke the Gothic Line in only thirty-four minutes! there is a more unbelievable story. It is the story of the Military Intelligence and Language Service. in a super-secret branch of the military. that helped to break the stalemate in the Pacific. to help win the war in the Pacific. and saved a million Allied lives. Never had so many owed so much to so few. and know of your service. I wish every American could know your story. for what you did for the country and for democracy. remember what you did for them and for all of us. Your legacy continues to protect us all. keeping Iranian Americans possibly in protective custody. Senators Daniel Inouye and Spark Matsunaga said, "You can't do that. That's already been done, and you were wrong then. "So your wartime service protects all of us. You made it work, and you made it work for me, for your children, and for this country. is all of one color. America stands unique in the world, the only country not founded on race. but a way, an ideal. where you wanted and do what you wanted to do. You went about your lives, but you made sure that your parents could become citizens. 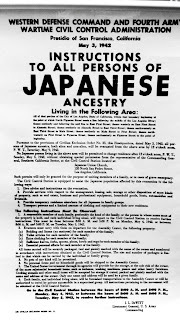 By 1953, you saw your parents naturalized. Your parents had to wait, in some cases, sixty-five years to become American citizens. And that they could own land for the first time. And that others of Asian descent could own land for the first time. without the discrimination that you suffered. Some of you became lawmakers and entered the House and the Senate. and the early 20th century against Asians. and overturned one by one. Sparky Matsunaga and Dan Inouye, veterans of the 100th/442nd, for doing that. upon which they could fight for those rights. Justice prevailed, and your parents became citizens. We stand at a pinnacle of your history in your golden years. perpetrated against its own citizens. 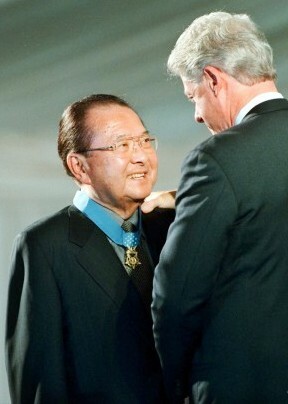 President Clinton belatedly awarded 20 Medals of Honor to Japanese Americans. they helped to define America at its Best." is sort of the icing on the cake. and what happened to us during the internment. lifted a cloud from my head. I now really feel like I'm truly American, and it was all worth it." and I thank you for sharing it with us. God bless you. And tell your kids to tell the world!